To evaluate the peritoneal dialysis (PD) program in our hospital, we retrospectively studied all patients dialyzed with this modality over the last 5 years. 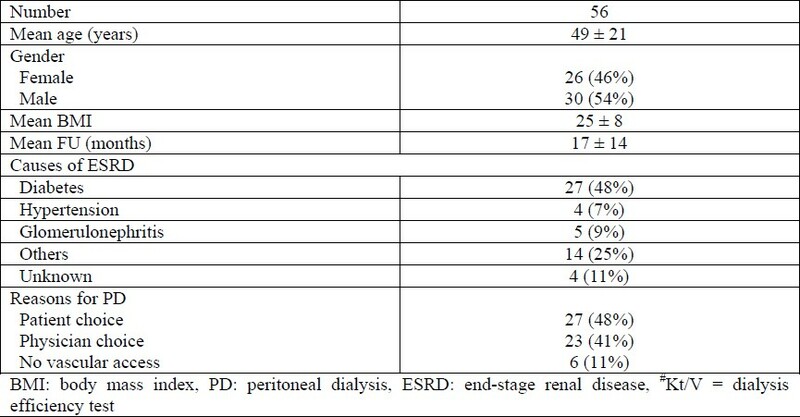 A total of 56 patients having end-stage renal disease (ESRD), with mean age ± SD of 49 ± 20 years (range 16-92 years), were dialyzed with PD: 38 (68%) patients with continuous ambulatory PD and 18 (32%) patients with automated PD. Twenty-six (46%) patients were females. The mean follow-up time of these patients was 17 ± 14 months. The underlying etiologies for ESRD in these patients were diabetes mellitus (48%), glomerulonephritis (9%), and hypertension (7%). Twenty-seven patients (48%) were put on PD from the start, while 29 (52%) patients were switched from hemodialysis (HD) to PD. Nineteen (34%) patients developed a total of 29 episodes of peritonitis. The incidence of peritonitis was 0.4 episode per patient-year. Exit-site infections occurred in 17 (30%) patients. No tunnel infection was observed during the study period. Non-infectious catheter-related complications occurred in 12.5% of the patients; six (11%) patients had hernia (umbilical or inguinal). At the end of the study, 23 (41%) patients continued on PD, 17 (30%) received a renal transplant, 7 (13%) suffered technique failure and subsequently switched to HD, and 9 (16%) patients died. To conclude, our study demonstrates that the rate of PD related complications is found to be quite low in our program, with an acceptable technique failure rate and mortality. Therefore, PD is a safe and an effective treatment modality in the integrated care approach to patients with ESRD. Chronic kidney disease (CKD) is a major health problem worldwide, including the King dom of Saudi Arabia. The number of the patients requiring renal replacement therapy (RRT) is growing at a dramatic rate in Saudi Arabia since there has been a steady increase in prevalence and incidence of end-stage renal disease (ESRD) over a 20-year period. Patients with incident ESRD have to choose between hemodialysis (HD) and peritoneal dialysis (PD) before kidney transplantation, since a few patients can have pre-emptive kidney transplantation. Different types of PD have evolved both for social convenience and to maximize the efficiency of the modality, which include intermittent peritoneal dialysis (IPD), continuous ambulatory peritoneal dialysis (CAPD) and automated peritoneal dialysis (APD). In the 1950s and 1960s, PD was utilized predominantly to treat patients with acute renal failure. Patients with ESRD were managed almost exclusively on HD and occasionally on IPD, until the introduction of CAPD in 1976, the use of which has increased steadily, and currently PD comprises roughly 15% of the total world dialysis population. ,, Young patients and those who maintain an active lifestyle prefer APD to CAPD because they are free of the need for a manual daytime exchange. The aim of this study was to evaluate the PD program at our hospital over the last five years and assess its safety, efficacy, and outcome in the treatment of CKD patients. This retrospective study was conducted at King Faisal Specialist Hospital and Research Center (KFSH&RC), Jeddah branch, Kingdom of Saudi Arabia. KFSH&RC is tertiary care hospital with an active nephrology service, which provides an integrated care approach to patients with ESRD. All patients dialyzed with PD during the study period from 2002 to 2007 were included. A total of 56 patients were studied. Data were collected in a structured Performa for all patients and included patients' demographic details and mode of PD, catheter (Tenckhoff) insertion technique, adequacy of dialysis, PD related infectious and non-infectious complications and final outcome of patients. Data were analyzed using statistical software SPSS and results were expressed in percentage and frequencies. During the study period, there were 56 patients on PD, with a mean age of 49 ± 21 years and a mean body mass index of 25. Twenty-seven (48%) of our PD patients opted for this modality of RRT from the start, while 29 patients (52%) were switched from HD to PD. The mean follow-up period for all the patients was 17 ± 14 months. Diabetic nephropathy was the commonest cause of ESRD in our patients (48%), followed by unknown causes (11%), glomerulonephritis (GN) (9%), and hypertension (7%). The remaining 25% included chronic pyelonephritis, chronic interstitial nephritis, congenital dysplastic kidneys, and obstructive uropathy. Majority of the patients (59%) had their Tenckhoff catheter inserted by open technique under local anesthesia and 41% of them had laparoscopic insertion under general anesthesia [Table 1]. Table 1: Baseline characteristics of the patients. We noted a few complications after the catheter placement. There were no catheter related complications in 87% of the cases. Four (5.4%) patients had blocked catheters due to adhesions and blood clots, 2 (3.6%) patients had pericatheter bleeding, 1 patient (1.8%) had pericatheter dialysate leak, and 1 (1.8%) patient had a surgical abdomen. None of these patients required catheter removal. Complications related to dialysis itself were divided into mechanical and infectious complications. In the first group, 6 (11%) patients developed hernia, mainly umbilical hernia, and another patient (1.8%) developed hemoperitoneum. The second group included the infectious complications; 19 (34%) of the patients had peritonitis, 17 (30%) patients had exit-site infection, and none of the patients had developed tunnel infection. The exit-site infections were caused by gram-positive bacteria in 36% of cases (of which 80% were Staphylococcus epidermidis), followed by culture negative and Pseudomonas in 29% of cases each, and polymicrobial in 6% of cases; the cause of the polymicrobial exit-site infection was uncertain. In the patients with PD related peritonitis, PD fluid culture was negative in 42%, followed by gram-negative bacteria in 32% and gram-positive bacteria in 26%; none of the patients had fungal peritonitis. The most common gram-positive pathogenic organism was Staphylococcus aureus (11%), while the most common gram-negative organism was Pseudomonas [Table 2]. The total episodes of peritonitis were 29 in 19 patients and the rate of peritonitis was 0.4 episode per patients-year. The patients with peritonitis were initiated on intraperitoneal vancomycin and ceftizidime pending culture results, and the regimen was changed based on the culture results. The total duration of treatment was 2 weeks. Two patients died with the peritonitis related complications, and the catheter was removed in one patient and he was transferred to HD. Table 2: Type of organism causing exit-site infection and peritonitis. Nine of our patients had positive serology; seven for hepatitis C and two for hepatitis B before starting them on PD. The nutritional status of the patients was mainly assessed using serum albumin in addition to anemia and bone disorders management [Table 3]. Table 3: Anemia and bone management. The patients' preferences were the key factors in selecting the mode of PD, which resulted in 70% of the patients on CAPD and 30% on APD. Efficiency of the dialysis was assessed by measuring weekly Kt/V; the mean value was 1.98. The characteristics of PD membrane were assessed by the peritoneum equilibration test (PET); the majority of the patients were in the low average group (58%), followed by high average (42%). At the end of the study period, 23 (41%) patients remained active on PD, 17 (31%) were transplanted, 7 (13%) were transferred to HD because of the technique failure, 7 (13%) died from non-PD related complications, which were mainly cardiovascular, and 2 (4%) died from PD related complications; septic shock secondary to peritonitis and bowel perforation. Diabetes mellitus, especially type-2 diabetic mellitus, was a major cause of ESRD in our PD patients. ,, About half of our new patients opted for PD as the first choice of RRT. This is probably due to the presence of dialysis nurse educator in our program. Peritoneal transport characteristics play a very important role in determining the optimal PD prescription for patients on PD. In previous studies it has been found that fast transporters had the worse patient and technique survival. , In our study, the majority of the patients were in the range of low and low average (58%) when PD was started. Majority of our patients either continued on PD or had kidney transplantation. A small percentage (13%) of the patients was transferred to HD due to technique failure. This study suffers from some limitations. It was a retrospective study and the sample size was small and the course of the residual renal function was not assessed in our study. We conclude that PD related complication rate is low in our center, with low morbidity and mortality. Only a small percentage of the patients was transferred to HD. It indicates that PD is a safe and effective treatment in integrated care approach to patients with ESRD. A national PD registry is needed to study this important population of patients in our region better. 2. Cunningham R. Choosing The best dialysis option in the patients with chronic renal failure. Henrich WL (ed): Principles and Practice of Dialysis 3 RD ed. ; Philadelphia, Lippincott Williams and Wilkins, 2004:103-10. 3. Devis SJ. Comparing outcomes on PD and HD. A case study in interpretation of observational studies. Saudi J Kidney Dis Transpl 2007;18 (1):24-30. 4. Rippe B. Principles, techniques and adequacy. Feehally J, Floege J, Johnson RJ (eds): Comprehensive clinical nephrology 3 rd Ed., Philadelphia, Mosby Elsevier, 2007;979-1000. 5. Rubin HR, Fink NE, Plantinga LC, Sadler JH, Kliger AS, Power NR. Patient rating of dialysis care with PD vs. HD. JAMA 2004;291:697-704. 6. Souqiyyeh MZ, Al-Wakeel J, Al-Harbi A, et al. Effectiveness of separate training for peritoneal dialysis patients: Saudi J Kidney dis Transpl 2008;19(4):574-82. 7. Abraham G, Pratap B, Sankarasubbaiyan S, et al. The developing world. Perit Dial Int 2007;28: 13-9. 8. Levy J, Morgan J, Brown E. Oxford Handbook of Dialysis, 2 nd ed. New York, Oxford University Press, 2004:380-3. 9. Gokal R, Hutchison AJ. Peritoneal Dialysis. Greenberg A, (Ed): Primer on Kidney Diseases 4 th ed. Philadelphia, Saunders, 2005:477-88. 10. Jondeby MS, Gcraldine G, delos Santos, et al. Caring for hemodialysis patients in Saudi Arabia. Saudi Med J 2001;22(3):1999-204. 11. Roca C, Dell , Aquida R, Rodiehiero MP. Peritoneal Dialysis: A clinical update. Contrib Nephrol 2006;150: 226-34. 12. Vonesh EF, Jon J, Snyder, Foley RN, Collins EJ. Differential impact of risk factors on mortality on hemodialysis and peritoneal dialysis. Kidney Int 2004;66:2389-401. 13. Jaar BG, Coresh J, Plantinga LC, et al. Comparing the risk for death with peritoneal dialysis and hemodialysis in a national cohort of patients with chronic kidney disease. Ann Int Med 2005;143:174-83. 14. Shaheen FA, Al-Khader AA. Epidemiology and causes of end stage renal disease: Saudi J Kidney Dis Transpl 2005;16(3):277-81. 15. Al-Khader AA. Impact of diabetes in renal disease in Saudi Arabia. Nephrol Dial Transplant 2001;16:2132-5. 16. Al-Jiffri AM, Fadag RB. Profile of Patients with end stage renal disease (ESRD) in Jeddah. Saudi J Kidney Dis Transpl 2003:14(4):536-8. 17. Lo WK, Lui SL, Chan TM, et al. Minimal and optimal peritoneal Kt/V target: result of an anuric peritoneal dialysis patient's survival analysis. Kidney Int 2005;67:2032-8. 18. La Milia V, Limardo M, Cavalli A, Crepaldi M, Locatelli F. Transport of peritoneal membrane assessed before and after the start of peritoneal dialysis. Nephrol Dial Transplant 2009;24(9):2894-8. 19. Goffin E. Peritoneal membrane structural and functional changes during peritoneal dialysis. Semin Dial 2002;21(3):258-65. 20. García-Ureña MA, Rodríguez CR, Vega Ruiz V, et al. Prevalence and management of hernias in peritoneal dialysis patients. Perit Dial Int 2006;26(2):198-202. 21. Malik GH, Al-Harbi AS, Al-Mohaya SA, et al. Chronic peritoneal dialysis- a single-center experience. Perit Dial Int 2003;23(S2):S188-91. 22. Thodis E, Passadakis P, Lyrantzopooulos N, Panagoutsos S, Vargemezis V, Oreopoulos D. Peritoneal catheters and related infections. Int Urol Nephrol 2005;37:379-93. 23. Fontan MP, Rodriguez-Carmona A, Garcia-Naveiro R, Rosales M, Villaverde P, Valdes F. Peritonitis-related mortality in patients undergoing chronic peritoneal dialysis. Perit Dial Int 2005;25:274-84. 24. Tzamaloukas AH. What affects the outcome of peritoneal dialysis? Going beyond the microbial etiology. Perit Dial Int 2002;22(5):563-5. 25. Abraham G, Padma G, Mathew M, Shroff S. How to set up a peritoneal dialysis program: Indian experience. Perit Dial Int 1999;Supl2: 123. 26. Piraino B, Bailie GR, Bernardini J, et al. Peritoneal dialysis-related infections recommendations: 2005- update. Perit Dial Int 2005;25 (2):107-31. 27. Kim DK, Yoo TH, Ryu DR, et al. Changes in causative organisms and their antimicrobial susceptibilities in Capd peritonitis: a single center's experience over one decade. Perit Dial Int 2004;24:424-32.